What the heck is Compliance & Where Do I Get a Certified Lift? Opening a new business can be exciting, exhilarating and downright stressful. Opening an auto repair shop needs to be approached with the same care as opening any other type of business. As a business owner, there are many factors you must consider. Healthcare, Insurance, OSHA, processing solutions, employees and the list goes on! You must dot your i’s and cross your t’s. Whether you are opening a shop for basic mechanical work (changing oil, spark plugs, filters, etc.) or you will be performing larger mechanical repairs (engine replacements, transmissions, etc.) you must look into requirements for special licenses and requirements under your city’s guidelines. Aside from the basics, like registering your business at the federal level and applying for local business license, you need to check the property’s zoning ordinance before signing a lease or purchasing a property for auto repair shop. You must review your city’s specific guidelines for safety as well as OSHA standards before designing your floor plan and establish a plan for your handling and disposing of hazardous waste along with special permits and licenses for waste disposal. Is the electrical in compliance? Is you garage floor adequate? You may need to have your concrete tested if you do not have the specifications from the owner or landlord. Knowing the strength and thickness of your concrete will help you determine the lift you can install. Are you required to install a certified lift? What is a certified lift? I’m glad you asked because this has come up in past experience where a customer has purchased a lift but was not aware that the city inspectors were requiring a certified lift. Unfortunately, we at Eagle cannot tell you if you need a certified lift — only your local city or local code enforcement agency can. Certification is a system whereby an independent, third-party, organization determines that a manufacturer has the ability to produce a product that complies with a specific set of standards. The Automotive Lift Institute (ALI) sponsors a certified program for automotive lifts. Certified products undergo a periodic re-evaluation and are required to be produced within the requirement of a documented quality program. Intertek Testing Services (ETL) is contracted by ALI to administer the certification program. ETL is a global product testing, inspection and certification organization. ALI has obtained accreditation for this program from the American National Standard Institute. This assures unquestionable integrity for the program. A certified lift must bear a third-party certification label (ALI/ETL) or it is not certified. Can my previously purchased lift be certified? No. After installation the structural design elements such as material composition and required stress calculations cannot be validated. Why are some required to have a certified lift while others are not? The United States currently uses a voluntary standards system where compliance with applicable standards is compulsory when mandated by regulation or requirements imposed by the authority having jurisdiction. When in doubt contact your city clerk and your state/federal OSHA. If you are considering buying an existing shop, do not assume that the previous owners have followed the due process. Do your homework, in the long run it will pay off and you will have a safe and successful business. 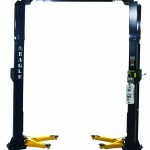 We have an ETL Certified 10,000 lb two-post lift available through Eagle Equipment.